Facilities & Administrative (F & A) costs, sometimes referred to as indirect costs, are costs incurred for common or joint objectives and therefore are not readily identifiable with a particular sponsored project, an instructional activity or any other institutional activity. Because these are actual (real) costs of doing business, we seek their recovery from grant awards in the form of F & A costs. Facilities costs can include, but are not limited to, utilities, custodial services, plant operations such as heating and cooling services, and maintenance expenses. Administrative costs can include, but are not limited to, payroll and accounting services, office supplies, departmental administration, procurement services, library services and sponsored projects administration. An example of an administrative cost might be a portion of the salary for a payroll clerk who processes biweekly and monthly payroll for an employee being paid from a grant. A portion of that clerk’s time is indirectly benefiting the grant. How Are Facilities & Administrative Costs Rates Determined? The federal government recognizes that it is not possible to accurately capture all costs of an organization that are allocable to a particular grant. Guidelines in OMB Circular A-21 (2 CFR, Part 220), Cost Principles for Educational Institutions, define a process for grouping costs into specified cost pools, which are then distributed to appropriate activities in a cost allocation process. Once the cost allocations are made, negotiations take place between the university and its cognizant agency, an agency designated to negotiate federal indirect cost rates. The University of Nebraska–Lincoln negotiates with the Department of Health and Human Services. Rates are generally renegotiated every three to four years. More than one rate has been negotiated by UNL. Rates cover organized research, instruction, Agricultural Research Division, Cooperative Extension Service and other sponsored activities. How Are F & A Costs Applied to Project Expenses? Federally negotiated F & A costs are charged against modified total direct costs (MTDC). Modified total direct costs exclude equipment, capital expenditures, charges for patient care and tuition remission, rental costs, scholarships and fellowships, as well as the portion of each subgrant/subcontract in excess of $25,000. It is UNL’s practice to exclude the total amount of any subgrant/subcontract to its sister institutions, UNK, UNO & UNMC.At UNL, equipment is defined as an item having an acquisition cost of $5,000 or more and a useful life of more than one year. Please note that on projects whose budgets include F & A rates other than our federally negotiated rates, F & A is generally charged against total (all) direct costs. You should be aware of the effect of rebudgeting on the F & A costs charged to a project. F & A costs are based on actual award expenditures, which may differ from expenditures originally budgeted in the proposal. In the example shown below, equipment expenditures (non-F & A bearing) were $5,000 more than the budgeted amount, while other direct expenditures were $3,390 less than budgeted, resulting in a $1,610 reduction in F & A costs. If you budget for a non-F & A bearing expense but then spend more in an F & A bearing account category, you must reduce the amount you can spend on total direct costs for the correct F & A to post. In the next example, equipment expenditures were $7,000 under the budgeted amount, while other direct charges were $4,746 more than the budgeted amount. The result is a $2,254 increase in F & A costs. What are the Current F&A Rates at UNL? For the latest F & A rates, visit the Facilities and Administrative Cost Rates page. How is the Correct F&A Rate for a Project Determined? It is UNL’s practice to apply only one F & A rate to each sponsored project. The rate most appropriate to the type of activity being performed in the project should be used. In addition, the off-campus rate should be applied only when the preponderance of project activities is performed in facilities not owned by the institution and/or to which rent is directly allocated to the project. 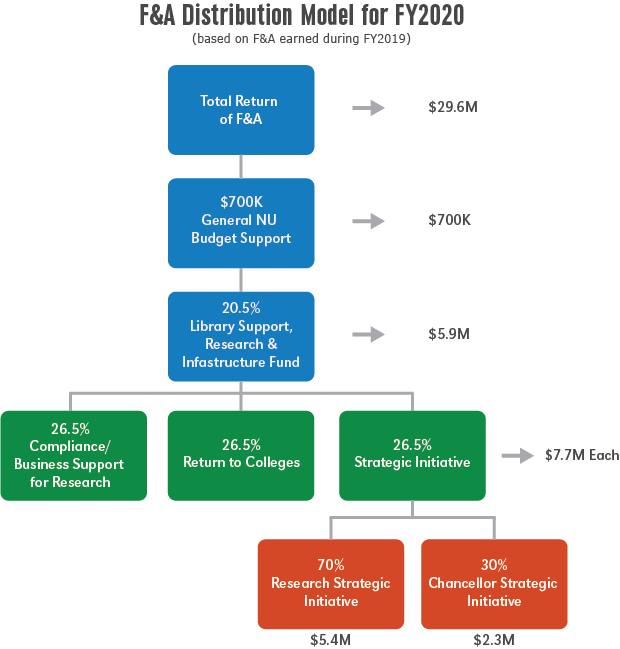 How Is F&A Distributed at UNL? F & A funds are shared with colleges across campus and used to build and maintain infrastructure and facilities, support faculty start-ups, fund required cost-share and fund costs of compliance. What is UNL’s F&A Distribution Policy? The first $700,000 recovered is directed to the university’s general operating budget as required by the State Legislature. After the general operating budget commitment is met, 20.5% of the remaining recovered F & A costs will be held centrally. The first $2 million of this amount will be used to support the Libraries and the remainder will support future infrastructure and research projects. One-third will be held centrally for reimbursement of the university’s costs associated with research, such as campus computing, libraries, faculty travel, compliance, research operations, etc. One-third will be held by the chancellor and the vice chancellor for research and economic development (VCRED) for strategic research initiatives, including seed grant programs, start-up funding, required cost sharing and bridge funding. In an effort to encourage investigators and investigative teams to propose large projects, the chancellor and VCRED will return an additional five percent of the recovered F & A costs to investigators for those competitive, full F & A-bearing grants with total costs of $1,000,000 or more per year. The five percent incentive calculation will be based on the amount remaining after reductions for the grant’s pro rata share of the $700,000 commitment to the university’s general operating budget and the 20.5% held centrally. For most individual or multi-investigator grants, the funds will be distributed to the appropriate college/administrative unit(s) indicated on the New Proposal Form in (NUgrant). The dean/director’s office will, at its discretion, provide the departments and/or centers a percentage of those funds. It is anticipated that these funds will be used strategically for research initiatives, faculty start-ups, bridge funding and required cost share, and to provide the necessary administrative support for research projects. For individual or multi-investigator grants proposed through an approved UNL center or initiative (list maintained by the VCR Office), 60% of the funds will be distributed to the college/administrative unit, 20% to the center/initiative, and 20% to the department. This is effective for proposals submitted after January 1, 2002. For large research initiatives (fully-competitive, full F & A-bearing grants, often referred to by agencies as center grants), 70% of the funds will be distributed to the center and 30% will be distributed to the college/administrative unit. These initiatives must be approved in writing by the VCRED prior to proposal submission and usually include projects for three or more years with budgets in excess of $1 million/year. This policy will be reviewed periodically by the Office of Research to determine its continuing effectiveness in strengthening the growth of research at UNL. Questions about this policy should be directed to the Office of Research (402-472-3123 or UNLresearch@unl.edu). Last rev. 7/22/2008. How Were F&A Funds Allocated in FY18? The Vice Chancellor for Research and Economic Development retains authority for waivers of F & A costs on proposals and awards. Because F & A costs represent true costs of a project, waiver requests should be limited only to those rare circumstances where the benefit to the university outweighs the monetary loss to the university. Some circumstances under which a waiver will be considered include: 1) the sponsoring agency has published policies limiting or prohibiting the payment of full F & A or indirect costs; 2) the project requires significant cost sharing that cannot be met by other sources; or 3) there are extenuating circumstances that support such a waiver.Because corporate sponsors are expected to benefit financially from the sponsored research, they are expected to pay UNL’s full F & A Rate. Any request for a reduction of full F & A must be thoroughly justified and signed by the cognizant department chair and dean, prior to submission to the Office of Sponsored Programs for consideration and submitted well in advance of the proposal due date. The Vice Chancellor for Research and Economic Development makes the final determination for all waiver requests. You will be notified via email of the final determination. For federal, state, and foundation proposals, if a sponsor’s published policy exists limiting our full F & A rate, a copy of the published policy (or a website where it can be found) is sufficient for justification. This request does not require approval by the department chair and dean.